I accept the Oceanos Cloud Portal Terms and Conditions. Feel free to run one of the free diagnostic reports or get started with a trial. Or you can take our word for it (15 years in business says something, right?) and apply your 1,000 record credit to your first live project. Take a moment to register and upload your data set. We'll run a diagnostic on your file and provide you with a customized Data Health Check Report. 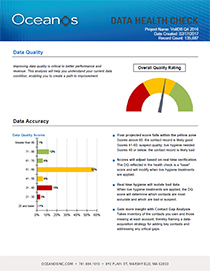 The report grades your data based on quality and completeness. You'll immediately see the impact we can make by removing bad data and filling-in missing fields. We'll also profile your data. You'll see how your contacts break out based on job level, function, specialty, and firmographics. Will the profile be in synch with your audience definition? If not, we're here to help you fix it. Take a moment to register and upload your data set. We'll run the GDPR Contact Data Screen on your file and provide you with a customized report along with your file with "country" appended. Click on the info sheet below for step-by-step instuctions. 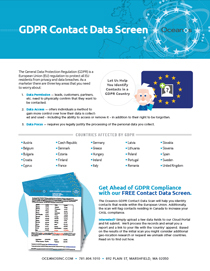 The GDPR Contact Data Screen will identify contacts that reside in one of the twenty-eight GDPR affected countries. While we’re at it we’ll also identify those in Canada to increase your CASL compliance.